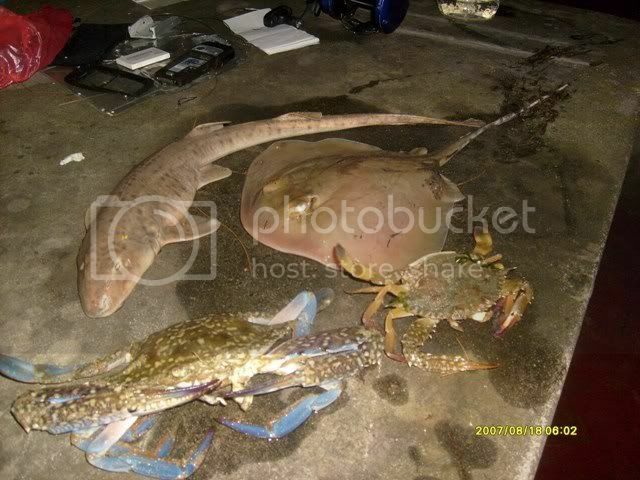 Decide to have an all out overnight fishing with the rest of the members and Man Kerapu from Eastcorez Surfanglerz. Reached Changi Village at Gary's to buy baits, food, drinks, light sticks and some other items in order to last the whole night. Reached at 4pm and set up tackles and cast out the first baits. Minutes later, it was raining and we dashed to save our things to the last hut of CP6. After the rain had stopped, only then Yan and the others arrived. 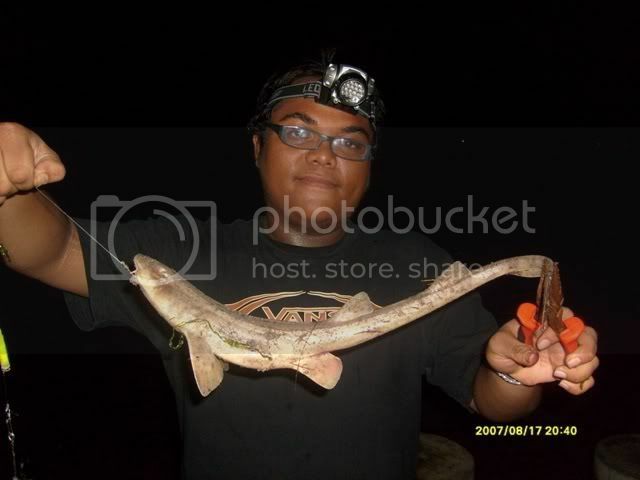 First fish of the night goes to Sazali for his Yu Bodoh (Bamboo Shark). It was not released as Yan had requested for the fish as his brother needs it for some medicinal concoction. Hours later, Raimi brought up his first fish since joining Singapore Surf Anglerz. A small female sandray of around 400grams. The night was not what we had expected to be as bite rate was very low and the sea was calm. There was not even sea breeze and most of us was feeling humid. Tua Bak aka Tamban Malam, prawns, crabs was abundant caught in Man netcasting and some are release as it was too small to be used as baits. The highlight of the outing which was consider a black night for both of the teams goes to Azzahar; myself and Man Kerapu. Man Kerapu handphone which was kept in his pocket had accidentally brought his phone while netcast for baitfish and the phone was damaged instantly. As for me, my 3250 handphone was missing only after i reached home. Tried to called my phone number but found out that some people whe have found the phone have actually switched it off. So i called up Starhub to suspend my phone line as soon as possible. Tried to go down again to Carpark 6 after bathing but it proved to be an unfruitful searches after asking around if any of the uncles have seen it.